FlowerColor Lipstick, Rosewood is a nice smooth lipstick that stays moist. The color was brighter and more intense than I had hoped for. Would buy Ecco Bella brand again. Beauty with brains. Discover the one lipstick that thinks it's a lip balm. The cleanest‚ safest‚ prettiest lipstick for those who love lipstick. And who doesn’t. 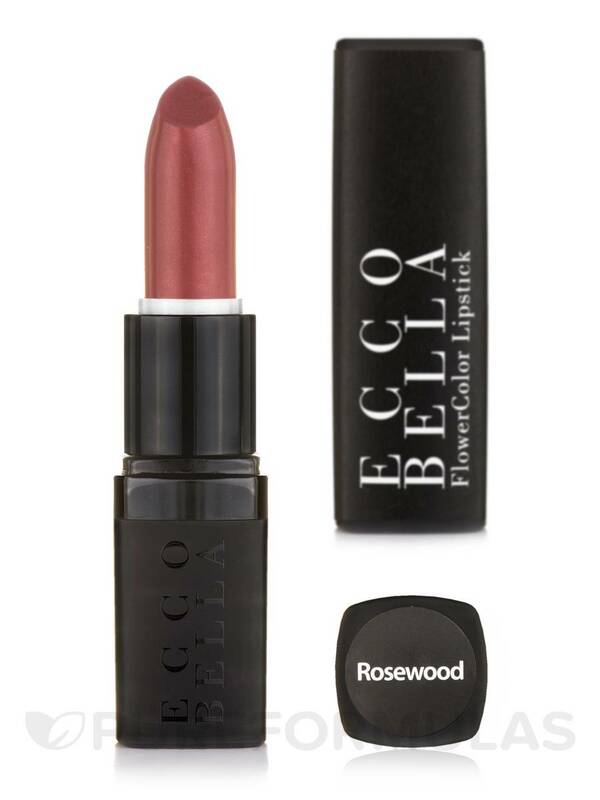 Eco Bella FlowerColor Lipstick is created with a simple healthy formula of vegetable waxes‚ oils‚ and mineral pigments that go on creamy and won't feather. 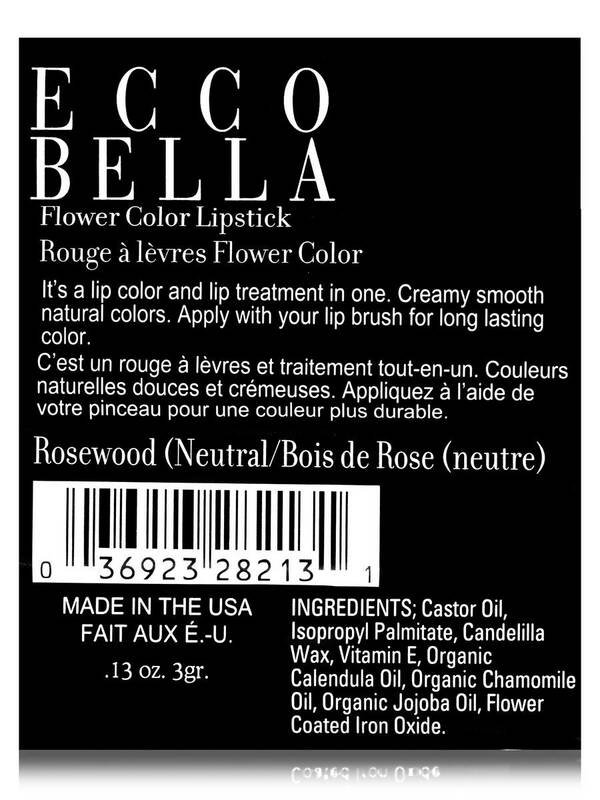 Like a lip balm‚ Ecco Bella FlowerColor lipsticks moisturize without flaking or chapping. Naturally-preserved. Gluten‚ FD&C dye‚ petroleum and fragrance-free. All are vegan except Pink Rose‚ Mauve Rose‚ Claret Rose‚ Tuscany Rose and REDvelation which are colored with carmine. Now‚ gorgeous lips have it made in any shade. Castor oil‚ isopropyl palmitate‚ candelilla wax‚ Vitamin E‚ organic calendula oil‚ organic chamomile oil‚ organic jojoba oil‚ flower coated iron oxide. 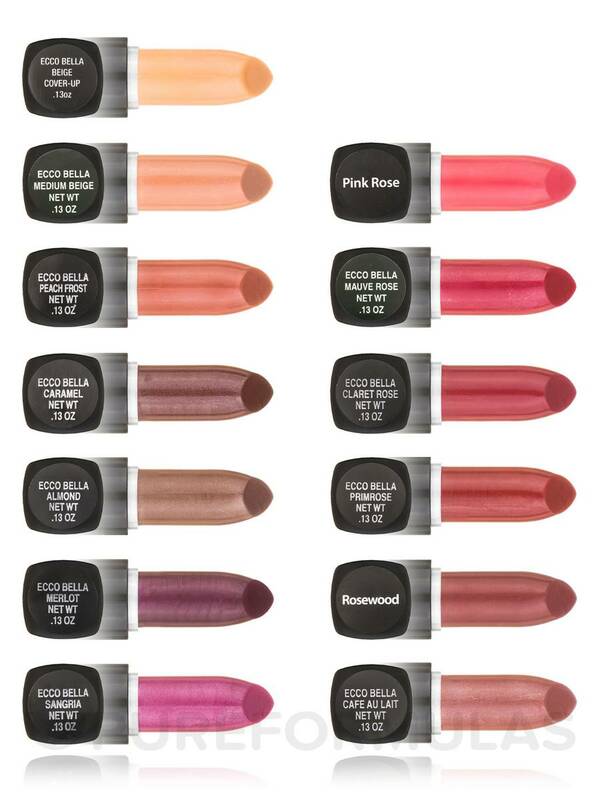 Apply with Eco Bella animal-free lip brush for long lasting color. Goes on easily, holds color.